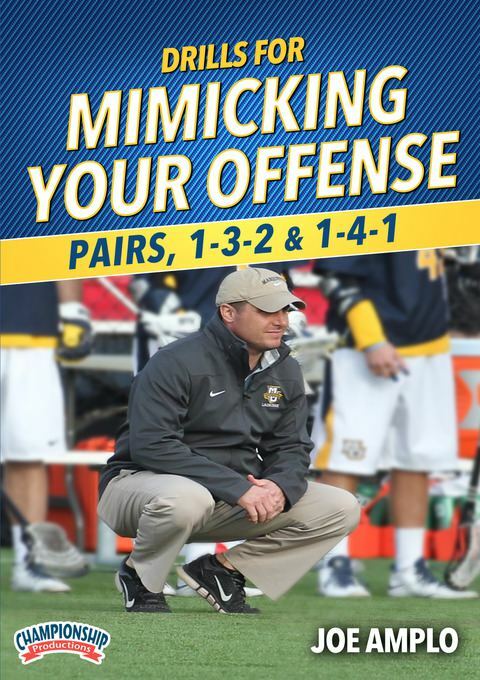 Joe Amplo was named the first head coach in Marquette men's lacrosse history in 2011. In just three years of competition, Ampolo has led Marquette to back-to-back semifinal appearances in the Big East Tournament (2014-15) and ranked as high as 9th in the nation. For his accomplishments he was named the 2014 Big East Coach of the Year. Prior to Marquette, Ampolo served on the staff at Hofstra University, starting out working under then head coach John Danowski. Rather than running standard shooting drills, Joe Amplo has given considerable thought to how his shooting drills can mimic, and therefore maximize the potential, of his team's offensive sets. Coach Amplo and Coach Stephen Brundage introduce several drills to help mimic offensive sets and situations in the two man, 1-3-2 and 1-4-1 sets. Coach Brundage provides insight into how to build offenses through the part-whole method, working in smaller groups and eventually building into offensive sets. He covers the Fade Series, a four part series of shooting drills that trains players on how to shoot on the run in their unique backpedal movement pattern. From fades, it adds three progressions: split, "Canadian quick" and hitch. The coaches add variation and subtle differences in each of the shooting drills to match the level of variation that players will see in the game. The team breaks up into smaller groups, such as 45 and 32 to goal, to change where the ball is coming from and give another look for the top side of the offense. You will learn skill work such as setting picks, flashers, slips, bail, throwback, double up picks with an outlet, seals, backdoor cuts, pops, and re-dodges through two-man and three man series drills. Various sets are also shown, with 4-man open sets, rollbacks, and finally 1-4-1 and 2-3-1 sets in settled 6v6 situations. This video is a great way to build a potent and fundamentally sound offense that takes advantage of various skills and tactics to break down the opposition and win more games.